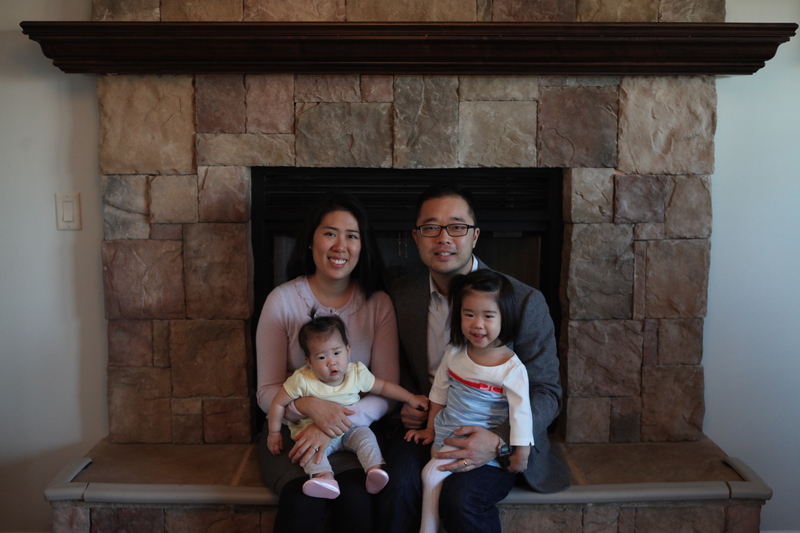 Today we introduce you to Kevin Kim, owner of Mathnasium of Champaign and dad of two girls, ages 2 years and 6 months old. 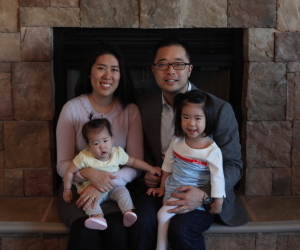 Kevin Kim, owner of Mathnasium of Champaign, with his wife and two daughters. Mathnasium of Champaign, your all-new neighborhood math-only learning center. 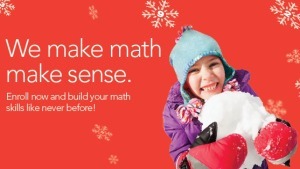 They help kids in grades 1st-12th understand math by teaching the way that makes sense to them. Mathnasium of Champaign will start sessions on January 26, 2015. To celebrate the grand opening, we are giving away a FREE month of classes, worth $299 (enter below). And if even you don’t win, here’s this great value – mention ‘chambanamoms’ and receive your assessment and registration for FREE ($199 value). I met my beautiful wife Jenny in Champaign and we have been married for 4 years. I always wanted daughters, so I feel very blessed to have two little girls (2.5 years and 6 months). Life moves so fast! It seems like just yesterday that my eldest daughter was learning how to crawl. My wife and I have become more intentional in our efforts to capture each milestone. We take as many videos and pictures as we can of our daughters crawling, talking, swimming and things like taking trips to the zoo. As I go back and watch these precious moments, I’m reminded of how quickly they’re growing and how blessed I am to have such a beautiful family. When I was choosing a college, UIUC was my first choice because I wanted to stay close to home (Chicago) while getting an excellent education. I also wanted to find a strong Christian community and Chambana had everything I was looking for! I’ve been at the same church since college and have been able to build life-long friendships and got to know many in our community. At the end of the day, I believe these are very important elements to one’s life so we’ve been happy to call CU our home. How do you balance owning your own business and being a dad? Honestly, I learn something new every day, but I think it’s the same for every father whether you own a business or work for one. I believe in working hard to ensure the best future for my kids, but I also try my best to make sure the time I spend with them is of the highest quality. Being a dad is not always easy, but at the end of the day, I LOVE it! Mathnasium is a learning center with qualified instructors, individualized instruction, and customized learning plans. Tutors only help students to get through “tonight’s homework,” but Mathnasium uncovers and directly addresses gaps in students’ knowledge that are the underlying causes of their current difficulties in school. Since math is a cumulative subject, it is extremely important to make sure that students have mastery of prerequisite knowledge from previous grades if they are going to have success in their current grade and beyond. Mathnasium bridges the gap between traditional and newer math programs by helping students master number facts, build computational skill and improve number sense. Beyond helping children earn good grades and achieve top scores on standardized tests, Mathnasium cultivates an intuitive understanding of math, teaching kids to become strong problem solvers and preparing them for bright futures. Help us welcome Mathnasium to C-U with this fantastic giveaway- one FREE month of classes by leaving a comment (mandatory) and tell us: what was your favorite subject in school? For a second entry, be sure to ‘like’ Mathnasium of Champaign Facebook Page. Come back and tell us that you did (or already do). For entries 3, 4, 5 etc. share this post on your favorite social media site and make sure to tag Mathnasium of Champaign. Be sure to come back and leave another comment to let us know that you did, with a link, please, every time. No purchase necessary. Contest will be wrapped up by 8 p.m. Monday, January 19. Winner will be picked at random by random.org. Open to U.S. residents 18 and older. Prize valued at $299 (no cash value). Remember: mention ‘chambanamoms’ and receive your assessment and registration for FREE ($199 value).